Retailers need to ensure ERP and e-commerce systems are suitably integrated. From New York to New Delhi, the evolution to multi-channel retail has impacted every element of the supply chain. Retailers need to ensure ERP and e-commerce systems are suitably integrated. From New York to New Delhi, the evolution to multi-channel retail has impacted every element of the supply chain. Consumers today can buy products merely by clicking on a retailer’s web site or by simply calling a store, and the concerned brand has to respond appropriately and also ensure consistency of experience. And, once again the supply chain has to be aligned to the new business environment. Clearly adopting to the new business environment is not only essential but it also helps drive growth, and studies have shown that European multi-channel shoppers tend to spend 15-30 per cent more than one who utilises just one channel. And, online fashion retailers have an inherent advantage with clothing and footwear segments representing the leading category purchased online, and the resulting strong growth for players like Zappo’s, Amazon and ASOS, amongst others. The rapid growth and maturity of the online fashion market has resulted in several consumer-centric strategies, including Try n Buy and allied customised services. Some websites have gone a step further and a model walks on an online runway with a particular product selected by a consumer, and the purchase decision is just a click away. And, the challenge for retailers once again is to ensure that a ‘glitzy’ website that can be easily accessible to consumers on a smartphone and allied mobile devices. The trick is to ensure that the marketing messages are smaller and easier to ‘digest’, as well as better targeted. In addition, brands need to have a strong presence on Google and allied search engines. However, to reach consumers who still use a rather basic mobile phone, it may require further simplification of a brand’s website and marketing message. In the absence of an internationally agreed, standardised technical framework, it is generally accepted that retailers who best solve the mobile payment puzzle, will be the winners. The challenges related to multi-channel retail are not just limited to the front-end of the business, but equally important is to ensure suitable linkages with the back-end systems. And, once again the integration of ERP systems with e-commerce would help fashion retailers ensure their products are delivered as per the order requirements. Apart from that, an ERP system helps track inventory and improves the efficiency of a fashion brand’s supply chain. However, given the nature of the fashion business, the integration of ERP with online activities must be designed in such a manner, that changes in product collections and seasons can easily be customised. And, in the fashion industry, where nearly 30 per cent of the products are returned, the need is clearly to ensure that the correct product is shipped in the first instance, as cost of returns are often borne by the concerned brand. In this context, it becomes extremely important that the IT and allied systems can give greater insight regarding a customer’s preferences; in terms of size, fabric, colour and quantity, amongst other attributes, and also via which channel of purchase. This would enable a retailer to take advantage of the opportunities not only online, but also on emerging avenues like interactive television. 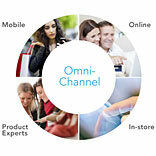 This would result in multi-channel retailing becoming omni channel. Taking the technological developments to the next level, and customer information available at any point in the entire supply chain via integrated systems spanning retailers, distributors and manufacturers, it would be far easier to predict consumer behaviour, as well as ensure better service to her. And, in the emerging global scenario where nearly half the population is utilising a smartphone, there is both an opportunity and threat to fashion retailers, and the most agile and integrated fashion businesses would seize the opportunity. One must not forget that other channels are also rising quickly. For instance, in an interview, Steve Koenig of the Consumer Electronics Association highlighted that by 2013, 55 per cent of televisions shipped will be Internet-ready, compared to just 18 per cent a few years earlier.